The Beta Pi Chapter of Delta Sigma Phi Fraternity had its beginning in the fall of 1947. Francis Wacker, the expansion director for Delta Sigma Phi Fraternity at the time, met with sixty men from Douglas Houghton Hall, a dormatory on Michigan Tech campus. Dr. Marriott Bredekamp, a professor of chemical engineering and Delta Sigma Phi initiate of the Alpha Sigma Chapter, was also present. Mr Wacker, who later became Executive Director of Delta Sigma Phi, gave a good presentation and the Delta Sigma Phi Club was formed that night. Officers were elected and a new colony of Delta Sigma Phi was born. To show their enthusiasm in becoming a chapter, the Beta Pi Colony fired up and took first place in the Winter Carnival competition that winter. Through the combined efforts of Dr. Bredekamp (Doc) and Francis Wacker, Beta Pi became a chapter March 7th, 1948 A.D.
Delta Sigma Phi was the first national fraternity on the Michigan Tech campus. The brothers of Beta Pi, under the guidance of Doc, began looking for a chapter house. Doc had seen his own chapter nearly fold because of poor financing and was very helpful in setting up an Alumni Control Board. It was the responsibility of the ACB, which later became known as the Alumni Corporation Board, to watch over chapter affairs and help prevent unnecessary hardships similar to those faced by Doc’s original chapter. In the late 1950’s the mortgage on the original house was paid off through a building bond set up by Doc and the ACB. Talk then turned to the possibility of building a new house. Thanks to Doc’s efforts, and his money, the property on which the current house sits was purchased in 1959. In the spring of 1964 construction of the house began and in the fall of that year, the brothers moved in. 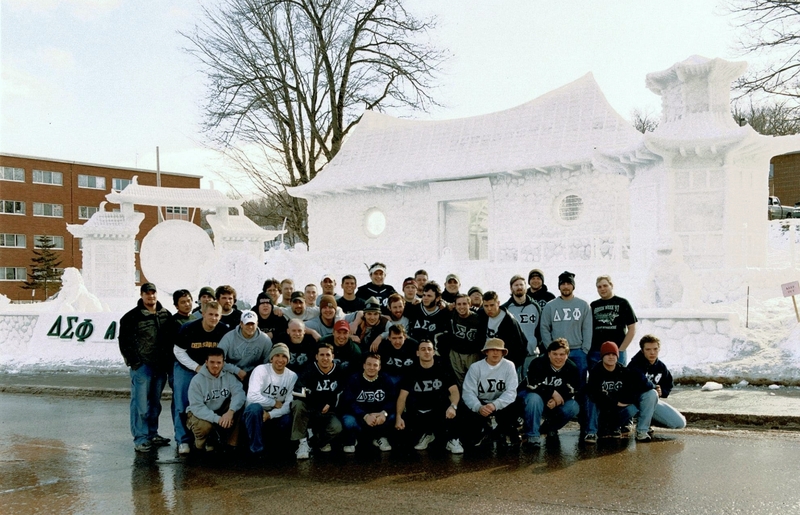 Through the combined efforts of many brothers, and mainly Doc, Beta Pi had the first “new” fraternity house on campus. Without Doc, the house would have probably never been built. To show our appreciation for his dedication, the brothers of Beta Pi hung a special plaque above the front door to give special thanks to Doc Bredekamp. From the beginning, Beta Pi has been active in campus organizations such as Concert Lecture Board, Undergraduate Student Government, etc. We have also made it a very proud tradition to “Fire Up” and participate in all types of IM Sports and activities, not to mention make tremendous showings at the annual Winter Carnival competitions. We have a proud tradition here at Beta Pi. We also have the motivation and desire to be the “Number One” fraternity on campus, which doesn’t necessarily mean a first place trophy. As the door closed on the final moments of the nineteenth century, a handful of undergraduate men began meeting between classes at City College of New York. Some had known one another before they graduated from the New York public school system, and they had wanted to continue their friendships at City College. The obvious solution was to join a fraternity, but there was just one problem: This was no ordinary group of undergraduates. They were an affiliation of Jews and Christians; and, at the time, entry to all-Jewish and all-Christian fraternities was barred to individuals and groups that mixed religions. Given that their close association challenged the conventional behavior of the day, perhaps it was only natural that the undergraduates took an even bolder step by founding their own Fraternity on December 10, 1899. Symbolized by the Greek letters Delta, Sigma, and Phi, the Fraternity was based on the principle of the universal brotherhood of man. Uptown from City College at Columbia University, the second chapter was organized in 1901 but did not become a chapter until 1902. To differentiate the chapters, the first was called Insula, from the Latin insularis, since it was on the island of Manhattan. Because of its location in Morningside Heights, the new chapter was called Morningside. Although such principles later would invite problems, the basic concept of the Fraternity-embracing brotherhood and congeniality without regard to religion or race not only attracted other idealists as City College of New York, it set the stage for expansion onto other campuses.